Thank you for visiting Emblempros.com where you will find some GM official licensed custom car emblems and parts of the highest quality. 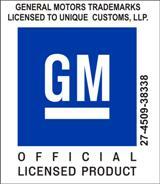 Just look for the GM logo (shown at the right) on the product listing detail page. We always strive to outdo and outperform similar manufacturers of custom car emblems and our prices are much more reasonable than you will find elsewhere for a similar product. We also offer custom emblems in our personal manufacturing capacity and we guarantee we will beat any reputable manufacturer's quote. Note: Due to many questions regarding what our Onyx Series is, and how it looks: We are attaching this YouTube video link to our homepage, so you can see it live - CLICK HERE. Please note that this is a chemically bonded True Mirror-Black finish, not simply a high-gloss black paint job, or black powder coat It is a unique material. You will absolutely receive an email when your order ships. Please allow "about" 5-7 business days for orders to ship. This will not always be the case, but is to be expected especially for orders with customized selections. We are very busy with incoming orders this time of year. We respectfully ask you to order your parts with this lead time in mind. We process orders in the same order they are ordered; First in, First out. If you order a custom part with us via email/phone that is a one-off design, this time frame should not be expected; it may take longer. If you have need of expedited shipping, it can be done. Please have patience with us. We always work hard, and many hours to get everything done as soon as we can. Thanks again!